Thursday, May 14 through Saturday, May 16 at 7:30 p.m.
Tickets for Thursday are SOLD OUT, but a wait-list will open one hour prior to the performance. Prior to each performance at 6:30pm, there will be a Pre-Performance Lecture led by Dr. Tom Hare, Professor of Comparative Literature at Princeton University. FREE and open to ticket holders only. As part of its spring 2015 Performing Arts Season and ongoing Society-wide series Stories from the War, marking the 70th Anniversary of the end of WWII, Japan Society presents a rare double bill noh program, New and Traditional Noh, offering Holy Mother in Nagasaki, written in 2005, and Kiyotsune written in the medieval period. Both plays narrating the grievous nature of war are performed back-to-back for three performances only. Written in 2005 by the late Dr. Tomio Tada (1934-2010), an internationally known Japanese immunologist and author of numerous new noh plays, Holy Mother in Nagasaki premiered in 2005 in Nagasaki, a region where Christians were known to practice covertly during Japan’s feudal period under Tokugawa shogun rule and where a significant Catholic population still resides. The evening’s companion piece, Kiyotsune, a centuries-old masterpiece by Zeami (circa 1400), examines the cruelty of war through the story of a grieving widow who meets her warrior husband in a dream, thus learning of his final battle. This New and Traditional Noh production is organized by the Tessen-kai Noh Theater Association, and led by prominent noh actor Shimizu Kanji. Performed in Japanese with English subtitles. Designated “Masterpiece of Oral and Intangible Heritage of Humanity” by UNESCO, noh is a form of traditional Japanese theater with a history dating back more than 600 years. 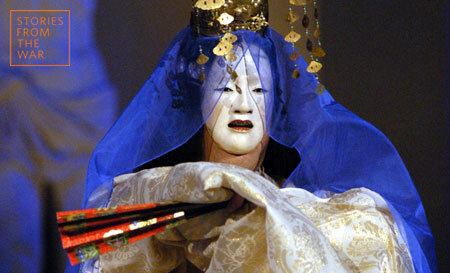 Holy Mother in Nagasaki (Nagasaki no Seibo, new noh play) is performed as traditionally stylized noh theater. The story begins in the present day when a pilgrim arrives at the beautifully restored Urakami Cathedral, which was destroyed when the atomic bomb was dropped on Nagasaki on August 9, 1945. There, the pilgrim meets the cathedral priest and asks him to share what he knows of that day and its immediate aftermath in the region. Through the priest’s telling, Holy Mother in Nagasaki imagines the Virgin Mary appearing to console the victims of the atomic bombing. This production features Gregorian chants performed live by female members of the Church of St. Francis Xavier Choir, New York. Kiyotsune (traditional noh), one of Zeami’s masterpieces, is a representative piece of shura-noh (noh about warriors). The play, exposing the cruelty of war, is built around an incident from The Tale of the Heike, telling the story of Kiyotsune of the Taira clan’s suicidal leap from his boat into the sea after learning about his clan’s fate. A lock of his hair is found on the boat and given to his wife as a keepsake. Experiencing deep sadness and also anger at her husband for committing suicide, the widow’s conflicting feelings collide and she confronts her husband’s ghost in a dream.